When HP first got our hands on Speer’s then-new Gold Dot G2 in October, we were really excited about it. After all, why would Speer put a newer version of the Gold Dot on the market unless it outperformed the original? Over the next few months I spent a fair amount of time, manpower, and resources testing the new 147 grain G2 9mm, and after almost six months, I’ve arrived at the conclusion that the G2 just isn’t the round it was purported to be. In fact, I guessed in the First Look article that it might be the real deal. Unfortunately, that opinion has been busted as badly as my March Madness bracket. In the world of ballistics testing, the bare gel test is the easiest one to pass with flying colors, so it’s the threshold test when I’m trying to get a baseline for a new round. And if a round doesn’t perform there, I don’t waste sheetrock, steel, or any other barrier material on it after that. The Gold Dot G2 will not even expand reliably in BARE gel. That is a problem. It’s a problem for a lot of reasons, not the least of which is that this round is currently marketed exclusively to law enforcement. Police officers depend on their equipment to get them home at the end of the shift, and this ammunition does not inspire the level of confidence those men and women need to have in their duty ammunition. Some of the rounds failed to expand at all and exited the back of the block never to be seen again (except for fragments they left on the way through…really…). 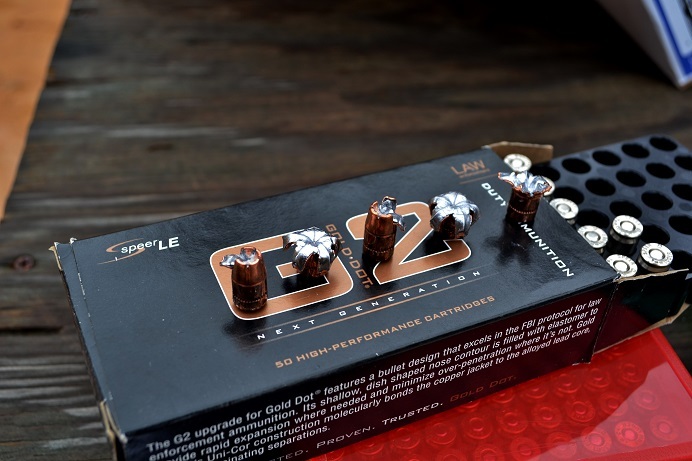 The recovered rounds penetrated around 15″ in bare gel, which would have been excellent were it not for the fact that the two fully-expanded rounds shown above are the only two that performed appropriately out of ten rounds. Use of force experts like to say something to the effect that your best shooting skills will be diminished by about 50% under duress in a self-defense situation. Adding a round into that equation that does its job only 20% of the time probably isn’t advisable. What this shows is that just because an alphabet agency or anyone else picks a round for their weapons, that decision does not make it the best choice for you. In fact, it may not even be a good choice for you. Because it may just not be a good choice. Although I know that a lot of well-respected experts were called in to test these rounds far earlier than Handgun Planet ever received any of the product, I simply cannot believe that they were testing the same product I have been experimenting with for several months now. Either they got an exceptionally great batch or I got a bad one. But based on the fact that multiple other people in the industry have demonstrated similar failures and concerns (Ballistic Radio, TTAG, multiple YouTube channels, etc. ), the facts might seem to indicate that the people who had the uncharacteristic product were the ones who had the product that allegedly lived up to the hype. 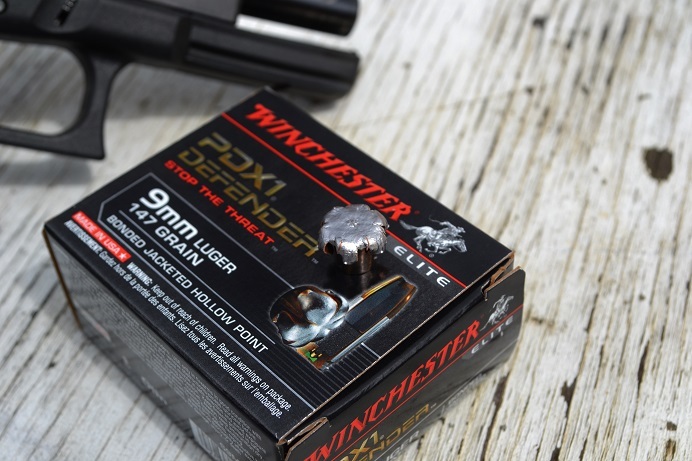 For the sake of comparison, the civilian-marked equivalent of another FBI contract load in 9mm, the Winchester PDX1 Defender (shown, right), expanded reliably to roughly the same diameter as the two G2 rounds that actually worked and penetrated to a comparable depth of 14.875″. I digress, but we’ll go into slightly greater depth with the Winchester Defender round at some point in the near future. Clearly, it would be the better choice between these two rounds right now. Please feel free to comment below or share your experiences with Gold Dot G2. Speer is supposed to be implementing a production change to fix these inconsistent performance issues, but for now we can’t suggest this round. We’ll test it again down the road, but over the next few weeks we’ll be focusing on rounds that have performed well in testing. Keep your eyes on the site and subscribe for any updates!